I attended the San Francisco Zen Center yesterday evening. 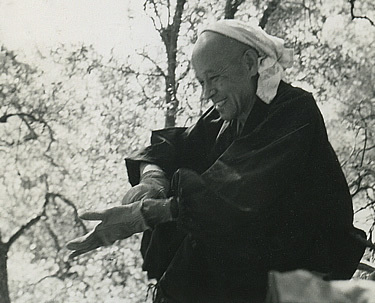 I had a wonderful time sitting in the location where Shunryu Suzuki first established the Soto Zen practice in the United States. I had read his biography over a year ago, The Crooked Cucumber. It, in combination, of Natalie Goldberg's books (on Zen and Writing) were the two influences that prompted me to delve into Zen Buddhism. Now, I try to go to the Northridge Beginner's Mind Zen Center when I have time and sit occasionally at home or in other meditation groups some of which are not necessary Buddhist but fill my need for sangha (like minded community). My current question is centered around my experience as an artist and how to navigate the dance making process while not succumbing to the whims of the ego (a big No No in the Buddhist world). This line of questioning actually started about a year ago, when I first created this blog. The challenge of being a performing artist is inherent in the art itself. Dance is a live art form dependent on others. If I were just a poet, I could feasibly write and write and write without ever having to show anyone and then allow my work to be found in a trunk after I am gone, not caring whether they publish a series of books from the vast amount of writing or simply stick it in the recycle bin. Being a poet seems like it would be so much simpler in that way. I wouldn't have to be around when others read it, I wouldn't have to worry about renting a studio or theater or gathering dancers to volunteer their time and talents for my vision. A poet can work alone, at any time, day or night without hindrance. But, I am a performer and a creator of performance. And, here is the crux of my suffering, I want people to want to see my work and (gasp) like the work. I haven't quite sorted that out yet. In the worst case it is because I am egotistical. The best case is that I have a mission to bring joy and mindfulness to the world through dance. The trouble comes when I can't tell which is the driving force. Am I merely a self centered egoist? Or am I the ultimate altruistic artist? Why am I driven to do what I do? I need to spend a lot more time figuring this out and ASAP. Because, in the meantime I am suffering. I suffer each time I feel a pang of envy, or a shake of insecurity. I feel it when I bristle upon hearing of others success and in all the hours I plague myself with self doubt and dislike for the work I create. I am suffering, and it is ugly. I don't like admitting it. I am embarrassed. But, this is the truth, and I gather that this is the truth for many or even most artists. We may not know why we are driven to do what we do and I believe losing the context of why we create plays a large part in our suffering as artists. I am fortunate that I make my living teaching therefore I don't have to make money with my art. But, it still feels overwhelmingly important to me. And, I want to make sure it is important for the RIGHT reason. Not to feed my ego but to feed my spirit and the spirit of the dancer and audience members (more on that coming soon). Here is a list I have come up with to help me determine whether I am working from a healthy or detrimental place. Perhaps you will enjoy the list as well. -- Focus on the other: sometimes I catch myself thinking too much about what other people are doing with their dances. This should be irrelevant. It is one thing to observe and enjoy; it is another to use these opportunities for either self validation or flagellation. --Frustration with the product: The product is irrelevant, art making is about the process. The dance should be nothing more than the residue of the creative experience. --Identification with the dance: I am not the dance. My success is not tied to the success of the dance. There is no success to be attained. --Desire for validation/accolades: This is a big one for me. I want people to tell me it was good! I want people to like it. But, I need to rethink why I want a positive response. It is because I hope to create art that touches the hearts of the audience or because I want praise. --Enjoyment/witness of the other: In watching a dance artist I am inspired to continue my path with the new insight from those around me. --Joy of Process: I know I am in the right place when going to the studio or rehearsal is fun! And, even problem solving is fun. --Focus on the Message: I create dances with a message (sometimes for me sometimes for the world). When I am creating from this place, it takes ME out of the equation and puts the goal of the art at the forefront. --Self care/ Self love: I know I am working from a healthy place when I can offer myself deep compassion through the struggles that are inherent in a creative process. When I forget to forgive myself/love myself/have patience with myself then I am in a fighting place. I am fighting with my ego that has expectations that are unhelpful to the process. ... I know I am creating from the right place. I must give credit to my friend and fellow poet (also a Razor Babe) Maggie Westland for this writing prompt, but I can't for the life of me remember where SHE got it. . . I am traveling again and one bit of homework I have for myself it to write everyday. And, to kick it off I am posting my first entry here for your enjoyment! 1. The Interstate 5 is a dreadfully long and straight road that will put any lone driver into a trance that can not be fended off with any amount of caffeine, thus forcing the driver to take a car-nap in Kettleman City while strategically parked beside a small tree in the Jack in the Box parking lot. 2. Yesterday Megill & Company had its second annual Tournament Day (the games of which include Gaucho, Corners, Kings Cup and our newly created Colors of Summer) to celebrate summer, and I have decided that it really deserves its own Anthem. And, flag. 3. Jonathon Safran Foer's Extremely Loud and Incredibly Close is a great audiobook, but is still no match for I-5's ability zombify the lone driver. 5. The windmill field on I-580 (known as the 580 to we southern Californians) is the best part of driving to the bay area. It almost makes the monotony of I-5 worth it. Almost. We can't all win the lottery… Or can we? I realized yesterday, as I was slugging through my long unattended email, that I hate checking my email. Rather, I always knew that I hated checking my email, but last night I think I have finally sorted out why. There is just too much information and too many "calls to action". I can't handle it, and it makes me feel terrible. I have a similar response to going on Facebook. It seems to me that most people on Facebook truly enjoying sharing part of their lives and have fun commenting and "liking" this or that picture, video, event or link. I, on the other hand, log onto Facebook with a sigh, a heavy feeling of obligation that just doesn't seem right. I have a pretty full life, I am active and productive in my career and in my hobbies. People think of me as a busy person who is high achieving. So, I guess it's probably true, but I don't feel high achieving. I feel like I am barely getting through, and often I get very disappointed that I haven't done more. Or, done what I do better. So, I am constantly working, and as a result I don't have time to even read through all my email let alone the Facebook postings on my home page. Plus, when I do get around to addressing my hundreds of emails and Facebook event invites, I have no choice but to decline or bypass most of them because I am too busy with my own projects and events. But, here lies the root of the problem as I see it. Each person has his or her own agenda, own project, own web series, own kickstarter, own performance, own blog, own Etsy, own e-paper. We have become a world of self starters (empowered to make our own project a success!) myself included. After all, I have my own dance company and I have my own blog (obviously as you are reading it). And, yes, I hope that people will support my endeavors by attending my shows and reading my blog. But, why? Or rather, why should people chose my project or show over another? Yes, we can all write blogs and produce performances, but if we are all busy on the creating end, then we are too busy to be on the receiving/supporting end. Sure, we can all start our own projects and kickstarter funds, but are there enough supporters and funds to go around? Is there enough room for everyone to be successful? Can every lottery ticket be a winner? I want to support the projects that come through my email and Facebook. 1. My friend Lauren Reeder's Web Series "Living with Models"
Out of the myriad requests that were sent to me, those are the only five I had time to address. But, I can't do that everyday! I am playing catch up! This is how I spend my vacation. We are living in a time when we are all individuals working toward individual or perhaps small group goals. Many of us have moved away from dedicating our lives to a large group organization, church or a club (Rotary or Kiwanis). We are working toward self defined goals that can be very exciting, but I think it is coming at a cost, because it is scattering our energies and perhaps even sabotaging the larger success of a few ideas. But, whose idea is worthy? Whose project deserves the greater success? Who holds the winning lottery ticket? Megill & Company (my dance company) has an opportunity to go to Istanbul next summer. At least, the trip is in the works. Of course the challenge will be financing the trip. Do I create a kickstarter? Do I try my hand in the lottery of projects, beseeching my friends and family to support my creative endeavors over someone else's project? Do you support something? Many things? How would it feel to just support other people for a while? To let go of my own projects and pour my energy into something bigger? Could I affect more change? It is very confusing for me as an artist. One thing is clear, I create because I have to create, and I know I won't ever be able to let that go. I believe my choreography is a form of social service. It is my gift to the world. So, whether i like it or not, I guess my lottery ticket is in the pool. In the meantime, I will be more mindful of others projects and see if there isn't a way I can better support them and their endeavors just as I hope they will support mine.